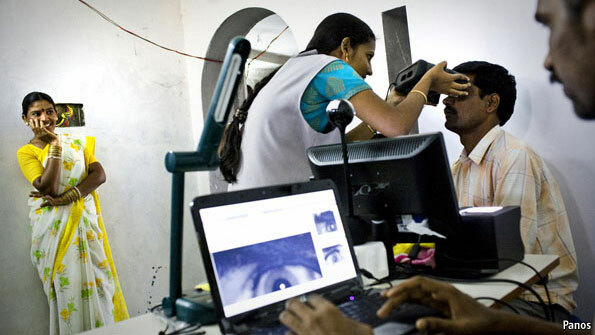 India's Biometric UID project is now the world's biggest Unique identification project( source). More than 40 million people are been added to this database every month. The number is expected to grow to 400 Million by the end of the year. The UID enrollments happen out of designated enrollment centers, and every resident of India is entitled to enroll. There had been concerns about authenticity of the Aadhar Data collected from various UID centers. In its note to the Cabinet Secretary, the Home Secretary has stated that the UID data collected by the various UID centres is not reliable as anyone can register themselves under any name and address( source). The Ambitious UID project aims at issuing Unique 12 digita identity number to all citizens of India. All citizens can register at UID centers across the country. The unique identification number (UI D) will be a 'number for life' for millions of Indians who are now excluded from access to public schemes.